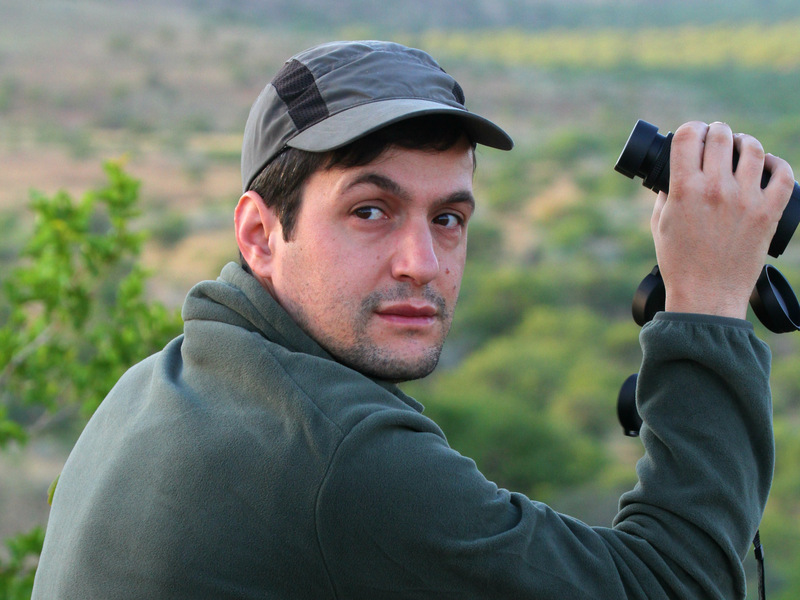 Pedro Prata, Team Leader of Western Iberia rewilding area. As much as he enjoyed life as a scientist and researcher, spending all day in a lab was not for him. It soon became clear to him that, in order to solve environmental problems, underlying social issues need to be addressed and that, ultimately, there could be no separation between the human and the natural world. Eager to broaden his horizons and witness first-hand what was happening in some of the world’s top biodiversity hot spots, Pedro crossed the Atlantic, spending formative years in the Caribbean, Brazil and the US. Inspired by the vastness of the landscapes and the sheer sizes of the nature reserves he visited, he returned home with a new vision for the Portuguese countryside: the restoration of native habitat on a large scale. With a group of like-minded enthusiasts, he started at the grassroots level founding his own company to work on the restoration of forests and floodplains. Technically, this meant he was now in the rewilding game, although he would not have called it that at the time. It was not until he came across a job opening at an organization called Associação Transumância e Natureza (ATN) that the term “rewilding” entered his consciousness. ATN is Rewilding Europe’s partner in Portugal, and at the time they were looking for someone to lead a rewilding project in the Côa Valley region of the Western Iberian peninsula. Pedro cutting the cake at the 15th anniversary of Associação Transumância e Natureza (ATN). For Pedro, this was a fantastic opportunity in many ways. 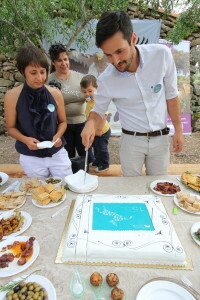 For one, it meant that he would get to represent his country in a new pan-European initiative, raising awareness about the hidden gems of Portugal’s natural landscape across borders. Most crucially, however, the project promised a new and bold approach to tackling conservation issues. According to conventional wisdom among traditional conservationists, human activities such as farming are a key driver of biodiversity and need to be continued to keep ecosystems intact. Rewilding challenges this notion and offers a paradigm shift, letting nature take care of itself without intense human management. To Pedro, this was a new and exciting perspective, and he wanted to be a part of this initiative. Today, rewilding is no longer a fringe movement within conservation. What started as an ambitious new vision has now entered mainstream debate, and Pedro is excited to play an active role in it. To him, there could be no better place than Western Iberia to put rewilding theory into practice. For centuries, the area has been strongly impacted by human activities whose marks on the landscape are omnipresent. Astonishingly, this long history of intense management has not stifled nature. On the contrary, there has been a remarkable wildlife comeback in recent years, and the area is abundant in biodiversity. At the same time, farming productivity is low, reducing the land’s value for traditional management. This means that a hands-off, nature-centric approach can increase not only its ecological and panoramic but also its economic value. The Côa Valley, a popular wine region with a rich heritage, already offers a strong tourist infrastructure. Adding wildlife watching and other nature-focused activities to the list of attractions will only add to its appeal and benefit both people and nature. To Pedro’s great delight, an increasing number of stakeholders are sharing this view, one of them being Portugal’s State Secretary who has spoken highly of rewilding and its many merits. 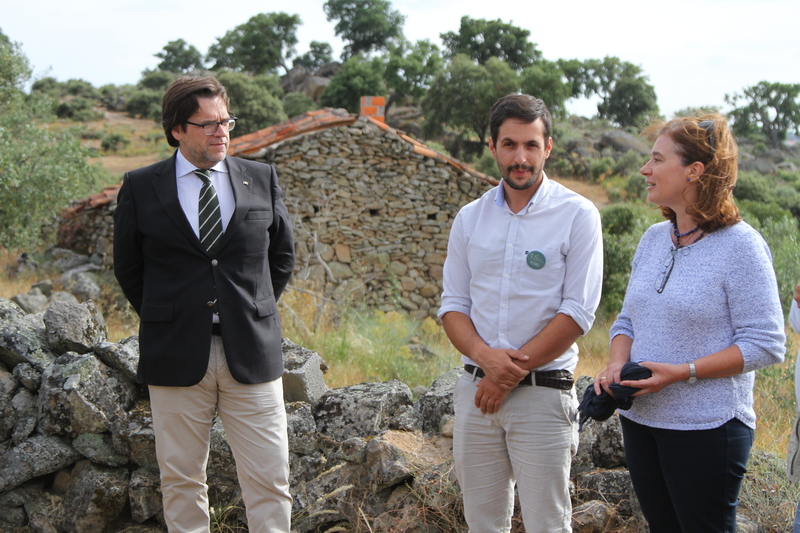 Pedro at the ATN celebration with Miguel de Castro Neto, State Secretary for Land Management and Nature Conservation (left) and Paula Sarmento, President of Governmental Institute for Nature Conservation and Forest (right). Moments like these make Pedro optimistic about the future of nature and wildlife in Portugal and throughout Europe. Other developments give yet more reason for hope. Unlike North America, where people and wildlife have traditionally been kept more apart, Europe’s dense human population does not allow for this approach. Out of sheer necessity, the European conservation model is based on coexistence instead of separation. Across many parts of Europe, this approach has been incredibly successful, with wildlife including large carnivores making an astonishing comeback in areas they had long vanished from. As much as we should be proud of this European success story, Pedro points out that there is still much to learn. In particular, he would like to see a less centralized approach to conservation. He points to Namibia where the government has returned land management to local communities, creating a sense of pride and ownership among the people who are ultimately most affected by what happens on their lands. To him, changing the power dynamic towards locally run on-the ground initiatives is the next frontier in European conservation. By leading the Western Iberian rewilding initiative, he is doing his part in making this vision a reality. This is the second part of a series about the Team Leaders in Rewilding Europe’s rewilding landscapes. Rewilding Europe volunteer Arne Loth who is based in the United Kingdom writes the profiles.